Curious on the lens cost price.. anyone can share ? Revealing the cost price is an unethical thing for people in the trade to do..
Hi, can i ask if you guys know if Prada SPR22Q - gems could be replaced? Hi , if i am not wrong, will have to replace the whole temple. However, have to check availability with the agent to see if that model still has serviceable parts. Branded specs usually comes with 1 year warranty. check with the shop you bought from. Could get a free replacement if its within a year. i don't mind supporting you as long as you are genuine, give factual advice, patient, give discount and have reliable after care as well. is this too much to ask? hope you don't misunderstand me. cos if you are tick all these boxes I will tell my friends as well to check your site out. 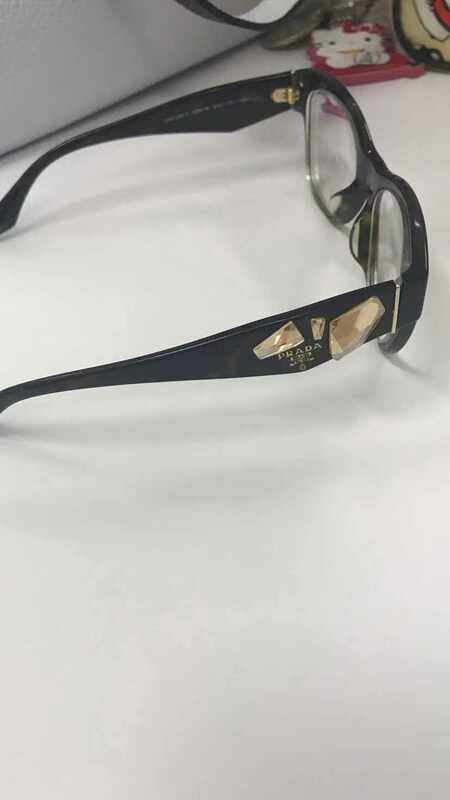 if i buy my own frame how much you charge for your lenses and is there a charge for putting the lens into my frame which i bought? Hi, appreciate if could PM me the shop details. Thank you. This spec frame is bought more than 3 years, the lenses were recently changed but one of the gems had dropped. I was wondering if I bring to the original Prada store, can 1 of the gems be replaced? is there a way to prevent lenses from turning brownish after a year of usage? Unfortunately No, it's just like wear and tear. All type of lenses face this issue? Checking out our shop will let you better experience our service though. We believe in providing maximum value for the lowest price to our customers, not discounted branded stuff that you don't need. Can you PM me your prescription for me to give you a quote? Normal clear lenses are inevitable to see those. No. There shouldnt be anything lighter than that from my knowledge. Apart from the material, the next factor to consider is the degree of your eye which will affect the weight. Perhaps I can weigh in (no pun intended) with my experience. My frameless Swissflex weighs in at 10g, Lindberg Air titanium rim weighs in at 15g. The 15g still feels comfortable, but really nothing can beat the weight of Swissflex.